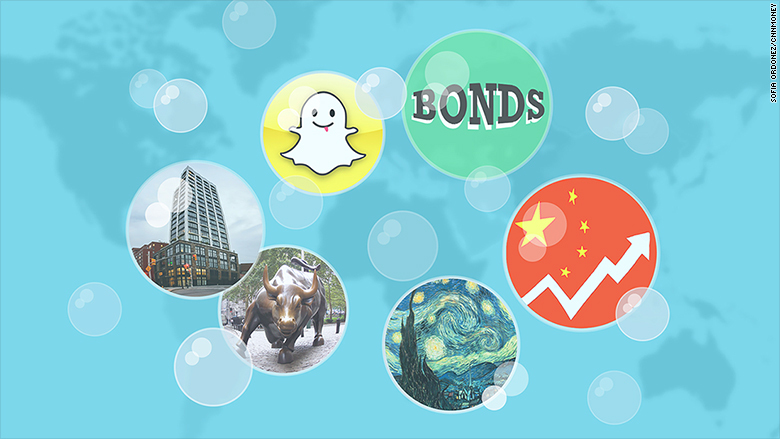 The next big bubble: Bonds, startups, China? Blowing bubbles can be fun, but even kids know they pop eventually. Do investors realize this too? Instead of oxygen, asset bubbles grow because of easy money and unreasonable investor expectations. For the past seven years, investors have been living in an era of extremely low interest rates. Investors have been basically forced into riskier assets to make money. That raises the potential for another dot-com style bubble (and crash) where valuations get way ahead of fundamentals. Is the same thing happening today? Possibly. "There are bubbles everywhere. When you've had zero and negative interest rates and massive amounts of money printing, how could we not be in some kind of bubble?" says Peter Boockvar, chief market analyst at The Lindsey Group. Bonds: Many investors believe the enormous bull market in bonds is defying gravity. The clearest sign that things are not right is that bond yields in Europe have actually gone negative. That's not supposed to happen. Investors are essentially paying to own the government debt of countries like France and Germany, which earlier this year sold a five-year bond with negative yield. "Fixed income is an epic bubble globally," said Boockvar. The question is what happens to the rest of the financial system if there's a huge correction in the bond market when the Federal Reserve finally raises rates, especially given concerns about liquidity in fixed income. Related: Is the bond bubble finally bursting? Startups: Young tech companies with little track record or revenue -- let alone profitability -- are raising money at a breathtaking pace. Bigger name companies like Airbnb, Lyft and Pinterest are garnering eye-popping valuations that rival those of public companies. Ride-sharing app Uber is reportedly being valued at $50 billion. Talk about surge pricing. SnapChat reportedly raised money at a $19 billion valuation in February, doubling its value just from December. Noted investor Mark Cuban said the startup bubble is "far worse" than the dot-com one. And even SnapChat CEO Evan Spiegel warned of a coming "correction" in the frothy startup world. A collapse in the pre-IPO market could dent confidence in the technology sector and the economy more broadly. "It could be a precursor to a bigger contagion effect down the line," said Ankur Patel, chief investment officer at R-Squared Macro Management. China: No major stock market is as hot as China's. It's up more than 100% this year alone, despite the fact that economic growth is slowing big time. The mega gains are being fueled by easy money from China's central bank. Retail investors are racing to join the party, with millions of people opening new stock trading accounts. Bank of America Merrill Lynch warned on Friday that "risks are mounting" in China as valuations "have come unhinged" from monetary conditions, corporate earnings and the country's economic growth, which has slowed in recent months. Investors poured $4.5 billion into China funds last week, the largest weekly inflow since April 2008, according to BofA. "That's a violent bubble move too," said Boockvar. Tech stocks: Investors are on guard for signs the bull market in stocks could be overdone. The U.S. stock market may be more expensive than its peers, but the rally has taken a breather in recent months. The S&P 500 is up less than 3% so far this year. That doesn't mean certain pockets of the market can't be experiencing bubbles on their own. Patel pointed to small-cap stocks as well as technology and biotechs as "areas of concern." Even Fed chief Janet Yellen warned last summer that smaller biotech and social media stocks look somewhat inflated. Art: It's not just stocks and bonds that are looking problematic. The high end of the art market has been on fire lately. Christie's sold a whopping $1.5 billion of art in three weeks earlier this year, including a Picasso that sold for a record-shattering $179 million. "As with high flying stocks, the logic was that the money had to go somewhere and why not a wall instead of a monthly portfolio statement," famed bond investor Bill Gross wrote in a note to clients last week. Nouriel Roubini, who predicted the 2008 crisis, recently warned that the lack of transparency into art prices makes it subject to "fads, fashions, manias -- and potential bubbles." NYC luxury condos: As the pre-crisis housing bubble showed, real estate markets can get out of whack with reality. Some observers are keeping a close eye on the market for luxury condos and other properties in hot destinations like Manhattan. A new condo in Manhattan will cost more than $3 million next year, working out to median of $2,158 per square foot, according to CityRealty. A two-level duplex penthouse in One57, a Manhattan skyscraper, sold for a record-breaking $100.5 million in January. Now what? Only time will tell which -- if any -- of these asset classes are actually in bubble territory. And even if they are, it doesn't mean the party will end any time soon. It's notoriously difficult to time when bubbles will pop. "No one knows when these things end. You could have bought the bubble in the Nasdaq in 1998 and had a great 1999," said Boockvar. Of course, your 2000 wouldn't have been so hot if you stayed in.